The real worth in achieving a goal is the person you become in order to accomplish it. It’s pretty obvious that in order to get different results, you have to do different things. However, there’s more to it than that. In order to things differently – long enough to make a real difference – you have to become a different person. The vast majority of people stop at ‘sounds good, I’ll do different things’, and never get to ‘I’ll become a different person’. Therefore, they fail at achieving their goal. And failure is by far the norm. New years’ resolutions, diets, missed targets, broken promises, and the most common one – total aversion to ever setting goals. 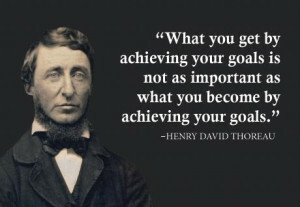 Hell, most people go through life avoiding the word ‘goal’. So, why do people omit the most important step of the process? The answer is fear. We fear change. We fear stepping out of what we know and are comfortable with. So, while we might be able to fake and force our way through taking different action for a while (exercising, dieting, budgeting, etc. ), it’s not possible to fool yourself into thinking you’ve actually changed. And, soon enough, you’ll return to who you are. There’s only one version of you who would say that, and it’s the current version. When you achieve the goal, you will never say it wasn’t worth it. If you do, then you didn’t pick a worthy goal. By definition a worthy goal has worth, and therefore it adds value to your life. Everyone who ever achieves a goal will confirm that, and the version of you who finally achieves your goal will say it too. So to be successful in achieving a goal, first drop the lie. Start the process with the truth: It’s always worth it. You might be surprised at how that changes your commitment, your confidence, your focus, and your drive to see it through. It’s always worth it because of the person you become.